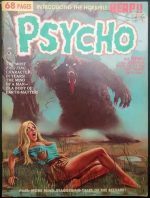 *Vintage Magazine-Sized Comics: In 1970, after the Warren horror comic magazines, Creepy and Eerie, had been successful for half a decade, the bandwagon jumpers were circling, and one of them was Skywald Publishing. Throwing together a bunch of Pre-Code reprints – artistically amended for added gore – and the occasional new story, they launched Nightmare, followed the next year by its companion Psycho. Successful enough to switch to all-new material, stories initially read like ersatz Warren tales, illustrated either by newcomers to the field – Jeff and Bruce Jones, Doug Wildey, Ralph Reese – or by folks whose professional careers were, by then, largely behind them (Syd Shores, Bill Everett). However, within a very few issues, writer/editor Al Hewetson’s – let’s call it ‘unique’ – writing style came to the fore, and the paranoid and often largely incoherent ‘Horror-Mood’, as he referred to it, became the norm. With a new, largely South American stable of artists, he created a miasmatic air of formless menace that challenged Marvel and Warren enough that they, according to Hewetson himself, colluded to deny Skywald distribution. We are delighted to have more of this oddball footnote in comics history in stock, with new listings for Nightmare from #6 to #21 (and its short-lived British reprint incarnation) and Psycho from #2 to #22. Illustrated are Nightmare #6 FN £13.75 and Psycho #2 VG/FN £11.50, with plenty more listed in our online catalogue!